The perfect pump for sprinkling, irrigation, firefighting and other high pressure applications. Heavy-duty Honda gas engine with oil sensor and Silicon Carbide mechanical seal provides the longest life in this class. Maximum pressure of 100 PSI for high pressure applications. 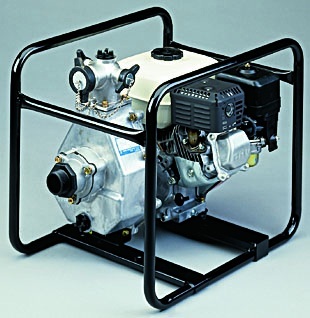 Versatile 3-way discharge allows pump to run up to three discharge lines simultaneously. Two 1" couplings and one 1 1/2" coupling. High head, closed impeller and cast iron volute casing deliver high performance and long wear life.